Last year we noted the pick-up in the number of companies pre-letting new or refurbished office space prior to completion. In the last 12 months the trend has picked up pace, with some 23 pre-lets announced in 2013 and a further 7 announced in the first three months of 2014. Recent examples include ING Bank at 8-10 Moorgate, EC2; Google at 6 Pancras Square, N1 and Estee Lauder at Fitzroy Place, W1. Agents are reporting, backed by Metropolis monitoring of current requirements, is that space under offer in central London, suggests that a large number of pre-let deals will be completed in Q2 2014. There is a trend for office occupiers to move relatively long distances across central London to pre-let the best quality space. High profile examples include Capita moving from the West End to 104,000 sq ft at 10 Aldermanbury in EC2; Hachette moving to 135,000 sq ft in EC4 from Euston; Ramboll moving to 30,000 sq ft at 240 Blackfriars Road in SE1; EY and Shell moving from Southbank to Docklands. Signs for the remainder of 2014 look encouraging, with some 4m sq ft under offer to companies such as Havas and Mizuho on various schemes currently under construction in central London. In addition, there are more than 500 lease expiries approaching on over 6m sq ft of offices in central London this year. The only question is will there be enough space to move into? 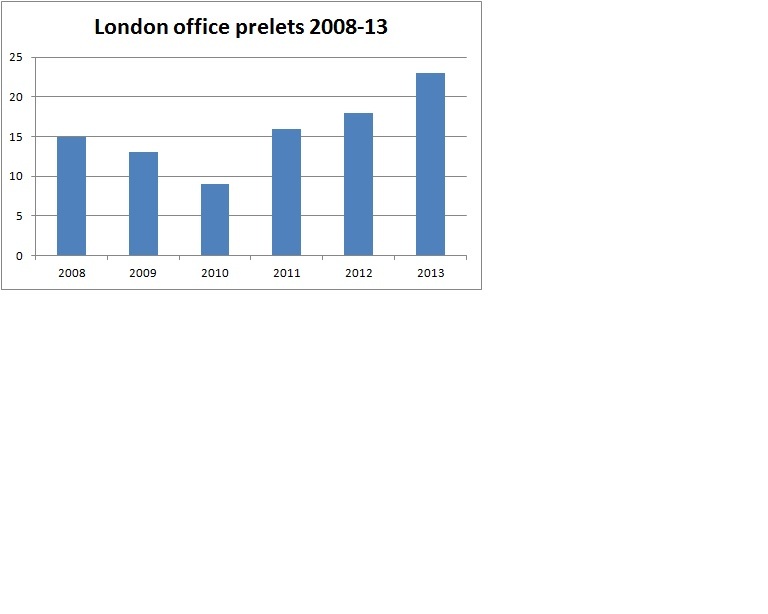 Central London office take-up surged in March 2014, reaching over 1.6m sq ft for the month. Large deals included Transport for London taking 250,000 sq ft at Canary Wharf, HCA taking 70,000 sq ft at the Shard and Google taking 160,000 sq ft at Kings Cross Central. Some 76 office deals of over 5,000 sq ft were recorded during March, of which 30 or 800,000 sq ft were for Grade A newly built or refurbished space, many of them pre-lets. The most active districts were the City and Docklands, with 600,000 sq ft and 400,000 sq ft respectively. The highest rent was a 6,000 sq ft letting to a hedge fund at 33 Davies Street in Mayfair, W1. Lease lengths were mostly ten years with a break in year five. After a sluggish start to the year, the surge of deals in March rescued Q1 2014 to bring the quarterly total to a respectable 3.1m sq ft and keep the Metropolis forecast of 12m sq ft take up in 2014 on track. A recent survey by the Bank of Scotland has predicted that 39,000 new jobs are expected to be created in the UK oil and gas industry in the next two years,. The survey predicted that the “largest share” of the extra positions would be based in Scotland. The survey of 100 companies is the bank’s third annual report on the oil and gas sector, with UK firms questioned about their future prospects for 2014 and 2015. Metropolis is currently tracking over 20 firms looking for office space in Aberdeen, including a number approaching lease expiries in 2014 and 2015. Examples include Amec and Premier Oil. Aberdeen has an office vacancy rate of only 3.5% making some searches protracted. The largest mover of 2013 was EnQuest’s pre-purchase of ‘The Grande’ from Drum Property for a new HQ building of 120,000 sq ft. There are five large speculative office schemes in the pipeline. A recent market bulletin by property consultant JLL mentioned the trend for London office occupiers to move across the central area in the search for the right office space. Research by Metropolis for its April 2014 London fit-out report bears out the point. Amongst the large grade A lettings completed in the last 12 months, some 25% of them involved companies taking space in different London districts to the one they are currently located in. Examples include: Capita moving from the West End to 104,000 sq ft at 10 Aldermanbury in EC2; Hachette moving to 135,000 sq ft in EC4 from Euston; Ramboll moving to 30,000 sq ft at 240 Blackfriars Road in SE1; Google moving from Victoria to 730,000 sq ft at Kings Cross; EY and Shell moving from Southbank to Docklands. There are many more smaller examples among last year’s 12m sq ft of office deals in central London. A review of the current near 700 outstanding requirements for office space in London suggests only 60% of occupiers are looking in only their existing office district, or adjoining areas, with as much as 40% of London tenants prepared to consider anywhere in the central area. Conversations with tenants suggest that the quality of the office space has become more important than micro location, when considering London office moves. In addition, there have been relatively few new office schemes completed in the West End in recent years which, in combination with high rents, has pushed tenants towards other areas. Looking ahead, recent deals in Q1 2014 suggest the process is speeding up with lettings at The Shard in SE1, Pancras Square in Kings Cross and a raft of deals in Canary Wharf, E14 showing a movement to good quality space in what could be considered slightly fringe areas. We expect this trend to continue through 2014 and 2015 based on the footloose searches by London tenants currently out looking.